Dr. Rechdi Ahdab, neurologist at LAUMC-RH, talks participants through brain death diagnosis. 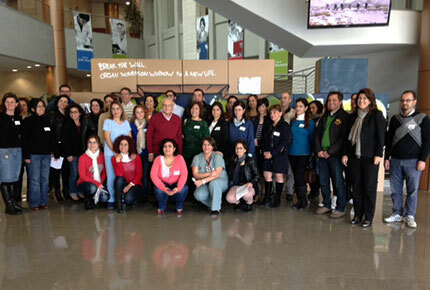 Participants and instructors gather for a group picture. 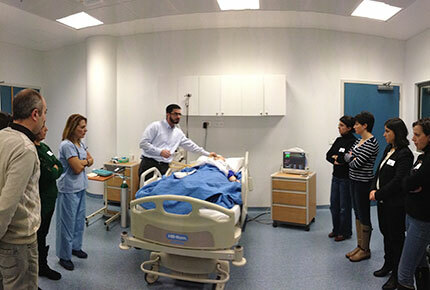 “ER and ICU physicians have to do everything they can to save the patient,” stressed Dr. Fayez Abillama to a group of nurses and doctors gathered around a mannequin on a hospital bed in LAU’s state-of-the-art Clinical Simulation Center. “However, the physicians should always bear in mind, when they receive a patient who could evolve to brain death, that organ donation can save a lot of lives,” he added. A critical care physician at LAU’s University Medical Center–Rizk Hospital (LAU Medical Center–Rizk Hospital), Abillama joined several other doctors — among whom instructors Dr. Rechdi Ahdab LAU Medical Center–Rizk Hospital neurologist and Dr. Georges Juvelekian critical care physician from St Georges Hospital — in leading a workshop on organ donation and transplantation at the simulation center on the Byblos campus on January 17. The workshop was the first of its kind in Lebanon, made possible by “the fact that we have the most advanced simulation center in the country that allows us to be a regional hub for this kind of training,” emphasized Dr. Vanda Abi Raad, an associate professor of Anesthesiology and the center’s director. Throughout the morning, 30 participants—doctors and nurses from all over Lebanon—split in groups of 10 and rotated around three stations representing the stages involved in the evolution of a critical care patient into an organ donor. These included the admission into the Emergency Room, the moment at which the patient is pronounced brain dead and the subsequent effort to keep him or her in a stable condition in order to protect the organs while waiting for the recipients to be prepared for surgery. Faour played an active role in organizing the workshop, as the Lebanese coordinator for the European-Mediterranean Postgraduate Program in Organ Donation and Transplantation (EMPODAT). The workshop at Byblos was the culminating event of a three-day training program on organ procurement offered as a joint activity by SOM, EMPODAT and Lebanon’s National Organization for Organ and Tissue Donation and Transplantation (NOOTDT). Judging by the enthusiastic response of the participants, the training resulted in exactly the outcome Stephan hoped for. Mariana Adra, who teaches Adult Care Nursing at the American University of Beirut plans on introducing new courses on the topic of organ donation next year. “I will definitely pass the message on to my students,” she said.